Due to these preplanned data, along with a recommendation by an Independent Data Monitoring Committee, Janssen, the manufacturer of the next-generation androgen receptor (AR) inhibitor, unblinded the study. Based on the positive data with apalutamide, the committee recommended that patients on the placebo plus ADT arm be permitted to cross over to the apalutamide group. Patients will continue to be followed for OS and long-term safety as part of TITAN. Full findings of the TITAN study will be presented at an upcoming medical meeting. Additionally, regulatory applications for apalutamide in this setting are planned to be submitted in 2019. The international, multicenter, placebo-controlled, double-blind, randomized TITAN trial enrolled 1052 patients with metastatic castration-sensitive prostate cancer who were newly diagnosed, regardless of prognostic risk, volume of disease, had an ECOG performance status of 0 or 1, and had prior therapy with docetaxel or localized treatment. Patients were randomized to receive oral apalutamide at 240 mg once daily plus ADT or placebo combined with ADT until disease progression, unacceptable toxicity, or end of treatment. The co-primary endpoints were rPFS and OS; secondary endpoints included time to chemotherapy, time to pain progression, time to chronic opioid use, and time to skeletal-related event. 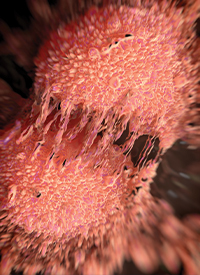 Patients with small cell, ductal, or neuroendocrine carcinoma of the prostate, brain metastases, lymphatic metastases, visceral metastases, a prior malignancy within 5 years of randomization, a history of seizures, or prior treatment with other next-generation AR inhibitors or CYP17 inhibitors, immunotherapy, or radiopharmaceutical agents were excluded. In February 2018, the FDA approved apalutamide for the treatment of patients with nonmetastatic castration-resistant prostate cancer (CRPC), making it the first FDA-approved treatment in this setting. Additional National Comprehensive Cancer Network guidelines state that apalutamide is a category 1 recommendation for patients with nonmetastatic CRPC, especially for those with a prostate-specific antigen (PSA) doubling time ≤10 months. In SPARTAN, 1207 patients were randomized in a 2:1 ratio to 240 mg of apalutamide daily (n = 806) or placebo (n = 401). The average baseline PSA doubling time was <5 months in both arms. Additionally, patients who developed metastases were allowed to receive abiraterone acetate (Zytiga) plus prednisone. The primary endpoint was metastasis-free survival; secondary endpoints included time to metastasis, progression-free survival, time to symptomatic progression, and overall survival (OS). For patients who developed metastases, the researchers also evaluated the time between randomization to first treatment for metastatic CRPC and subsequent progression (PFS2). Results showed that the median MFS was 40.5 months in the apalutamide arm versus 16.2 months with placebo (HR, 0.28; 95% CI, 0.23-0.35; P <.0001). Adverse events led to discontinuation in 10.7% and 6.3% of the apalutamide and control arms, respectively. Moreover, neither group had a reduction in mean baseline health-related quality-of-life scores as the trial progressed, and there was no difference over time in the scores between the groups. It was noted that PFS2 was longer for patients who were initially randomized to apalutamide. Janssen Announces ERLEADA®(apalutamide) Phase 3 TITAN Study Unblinded as Dual Primary Endpoints Achieved in Clinical Program Evaluating Treatment of Patients with Metastatic Castration-Sensitive Prostate Cancer. Janssen. Published January 30, 2019. https://bit.ly/2UuyCL1. Accessed January 30, 2019. Small EJ, Saad F, Chowdhury S et al. SPARTAN, a phase 3 double-blind, randomized study of apalutamide (APA) versus placebo (PBO) in patients (pts) with nonmetastatic castration-resistant prostate cancer (nmCRPC). J Clin Oncol. 2018;36(suppl 6s; abstract 161).